I recently wrote a post about the FISH! Philosophy and choosing your attitude at work. That got me thinking about the other ideas in the book and, specifically, the idea of play. This came up in my office just the other day and I have been thinking about its impact ever since. I began a good bit of self-reflection about what play means to me. To me, play is all about adding smiles to the office. This comes in many shapes and forms, but I feel it is about making people happy to the point where they show it on their face. Below are a few examples of what has stood out to me from my own experiences. Trivia: Something that many people do for fun after work was started a few months ago by an intern at my office. Each day he writes a new question up on the board and most everyone gathers around in the intern room to offer up a guess. Gradually, everyone has gotten into it and there is real competition against those who are in the lead. Donuts: While it doesn’t have to actually be donuts themselves, when someone brings in a treat (on all levels of the healthiness scale), there is commotion in the office. The discussion that comes about from people bringing in treats gives everyone a reason to come out of their office and socialize; that typically leads to jokes and laughter. Even those who gripe about having the temptation of eating sweets end up cracking a smile. Retreats: These can range from an hour spent outside together doing some team-building exercises to a weekend at a wilderness retreat with a ropes course. Both can be really impactful and provide many benefits for the office, but should also be a lot of fun. If you don’t come back from a retreat filled with purpose and fully engaged, then something wasn’t done correctly. Culture: To me, this is the most important part of play. Everyone needs to be involved. The Man can’t be walking around wanting to stop all of the fun being had. This also means that it can’t be forced – assuming that celebrating a birthday is going to get everyone having a good time. Creating a culture is a much larger issue, but one that must be in place to truly get the most out of play. These are just a few of the elements that I have seen that make an impact on play in the workplace. Creating smiles and improving happiness has a dramatic effect on performance. 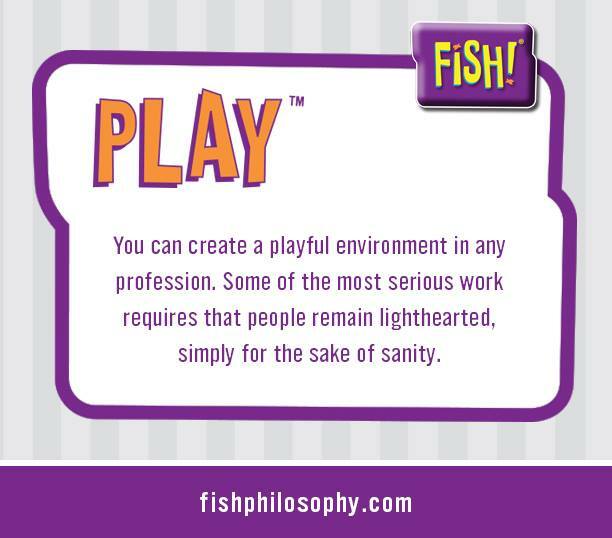 With that being the case, there is no reason that everyone in a company or business should not get on-board with play.